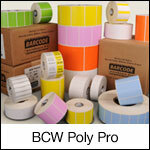 The BCW Poly Pro label is a premium matte topcoated white polypropylene thermal transfer label stock. This superb label produces high-quality black bar codes and human readable fonts when used with our BCW Wax/Resin ribbons. All BCW Poly Pro labels are resistant to abrasion, ammonia, bleach and water. BCW Poly Pro labels are compatible with a wide variety of surfaces and temperature ranges on corrugated, glass, plastics and metal. Use with BCW Wax/Resin Ribbons. 2.25" x 1.25" polypropylene thermal transfer label on a 1" x 5" core. 1700 labels per roll / 8 rolls per case. BCW Poly Pro 2153125 special features - Perforated. Use with BCW Wax/Resin Ribbon.